Welcome to the Enterprising Rabbit™—FIDDLE FRIENDS VIOLIN/VIOLA SHOULDER RESTS, TEMPOTAPE REMOVABLE HIGHLIGHTER TAPE, FIDDLE FRIENDS VIOLIN SHOULDER PADS, CELLO QUARTET MUSIC. 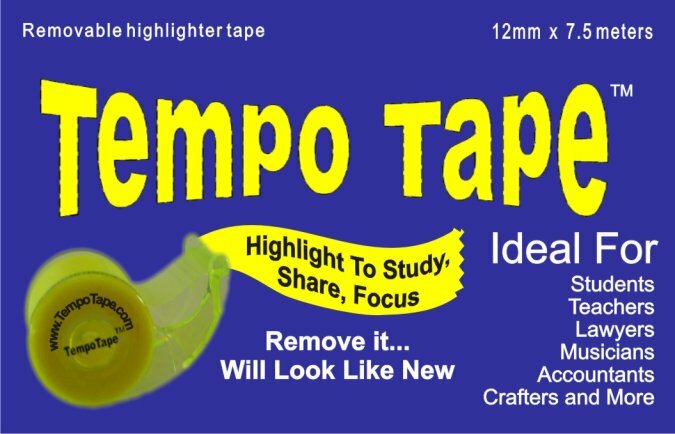 Try TempoTape™—the removable highlighter tape to accentuate details without making permanent marks. Available in three colours: Sunshine Yellow, Pink Grapefruit and Green Apple, all chosen for their superior transparency. 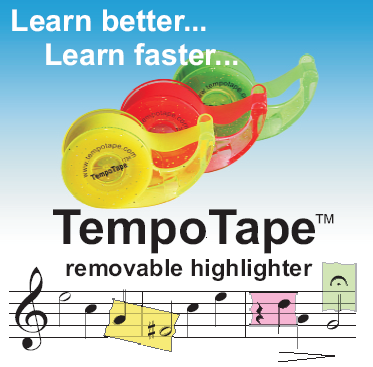 Each dispenser holds 7.5 meters of 12mm tape and will easily fit in a pocket, purse, or instrument case. Write on it! Remove it! Reuse it! Great for knitting and quilting patterns! Books and music will remain in reusable condition! Highlight marks on woodworking and crafting rulers for accuracy! Take notes or use as flags in library and borrowed books! Totally transparent! Leaves no residue! Wholesale and school orders are welcome: joan@enterprisingrabbit.com. Toll free phone/fax (866) 876-3123. Please inquire at 1-866-876-3123 for bulk orders.